Always dry your hair completely before using hot rollers. When you want to change up your hairstyle quickly, adding some bouncy curls is the perfect solution. But curling your entire head with a curling iron can be very tedious, which is why a set of hot rollers is such a good alternative. If you're shopping for hot rollers, though, you want to be sure to choose the best set for your needs. That means figuring out the right material and roller size, as well as how many rollers you need and what other features will be helpful when you're curling your hair. Our helpful shopping guide has all the information you need to choose the perfect hot rollers for your home. If you're still not sure which set to buy, our specific product recommendations are a great place to start. Hot rollers are usually made of a few different materials. Ceramic rollers utilize infrared heat and aren't as likely to damage hair as other materials. They're especially ideal if you want smooth, shiny curls. Sponge or foam rollers use steam to curl the hair and are also very gentle, so they are an effective option if you have fine or thin hair. They heat quickly and produce long-lasting curls too. Wax core rollers maintain their heat longer than other materials, but they tend to require more time to curl the hair fully. Their main benefits are that they produce the longest-lasting curls and work extremely well for thick, coarse hair. 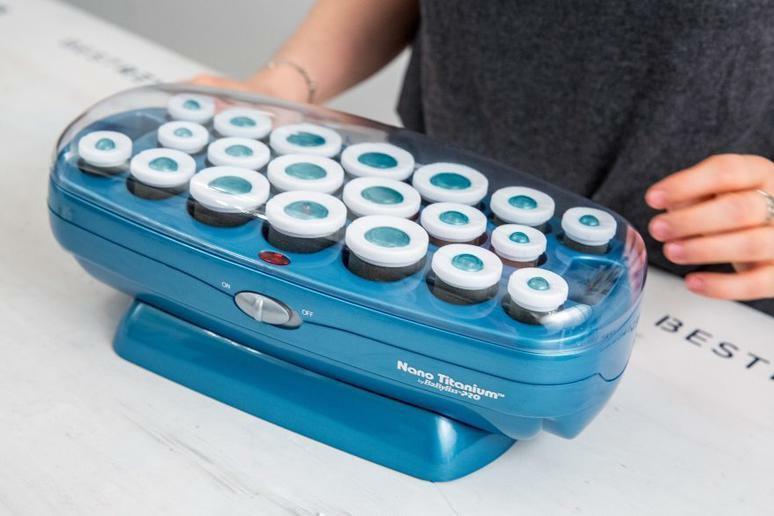 Wax core hot rollers are also ideal for hair that doesn't curl easily. The size of a hot roller determines how tight or loose your curls are, but you should also use the length of your hair as a guide when choosing roller size. As a general rule of thumb, the shorter your hair is, the smaller rollers you'll want to use. 1" or smaller rollers create tight, defined ringlet curls. They're also a good option if you have hair that's shorter than shoulder length. 1 1/4" rollers produce medium-size curls that work on any hair length. 1 1/2 to 1 3/4" rollers create large, loose curls and are effective for creating major volume. They're ideal for shoulder length and longer hair. Hot roller sets can include as few as eight rollers and as many as 30. Sets that include mainly large rollers usually don't include as many as those that feature mostly medium to small size rollers. The length and thickness of your hair may affect how many rollers you'll need - longer, thicker your hair usually requires more rollers to curl. Hot rollers can have either a ribbed or a flocked finish. Ribbed rollers have small ridges along their surface, which some users believe make the rollers easier to remove. They're also effective for thick and coarse hair. Flocked rollers have a smooth, velvety finish, which grips the hair well, so they're ideal for fine or thin hair that doesn't have much texture. Most hot roller sets heat up to one predetermined temperature, but there are some sets that have multiple heat settings so you can choose a temperature that's best for your hair. Some have two heat settings, while others have up to four. A set with multiple heat settings is a particularly good option for fine hair, which usually doesn't need such high heat to curl. Hot roller sets generally range from $15 to $125. Smaller sets of foam rollers that only feature a single roller size usually cost between $15 to $30. Mid-size sets of ceramic rollers that include a variety of sizes typically range from $30 to $60. Large sets that feature a wide variety of sizes and accessories can cost between $60 to $120. Q. Are hot rollers safe for my hair? A. As with all heated styling tools, hot rollers can damage your hair if you're not careful about how you use them. That's because heat can dry out your hair and leave it brittle and frizzy. Limit your use of the rollers to once or twice a week, and always apply a heat protectant product to your hair before you add the rollers to limit any damage. Q. How long do hot rollers take to curl the hair? A. If you have fine hair, it's usually recommended that you leave the rollers in for 15 to 20 minutes. For thick, coarse hair, let them sit for about 30 minutes before removing them. Our take: Creates long-lasting curls quickly and easily. Pricey, but they're the best set on the market. What we like: Rollers have a titanium core that helps curls last longer. Flocked finish is gentle on hair. What we dislike: Doesn't have an indicator light to let you know rollers are ready. Included clips aren't compatible with every hair type. Our take: Uses steam to curl hair and needs frequent maintenance, but the budget-friendly price tag makes this set an excellent value. What we like: Heats up in 15 seconds. Comes with carrying case for travel and handy style guide for styling inspiration. What we dislike: Must be cleaned regularly to prevent corrosion and mineral buildup. Our take: An ideal set of rollers for travel that boasts both durability and reliability. What we like: Heats in three to five minutes. Cord detaches for each storage and rollers have flocked finish to protect hair. Has an indicator light to let you know the rollers are ready. What we dislike: Some users complain about cracks in the base.